Product prices and availability are accurate as of 2019-04-14 09:46:56 EDT and are subject to change. Any price and availability information displayed on http://www.amazon.com/ at the time of purchase will apply to the purchase of this product. About Ram-Pro 65 Piece Quick Splice Connector Kit (Scotchlok). Complete your next wiring project with the Ram-Pro High Quality Quick Splice Connectors. Use them anywhere around your home/vehicle for lighting, electrical outlets and more. They are made for use with 24-10 gauge wire. 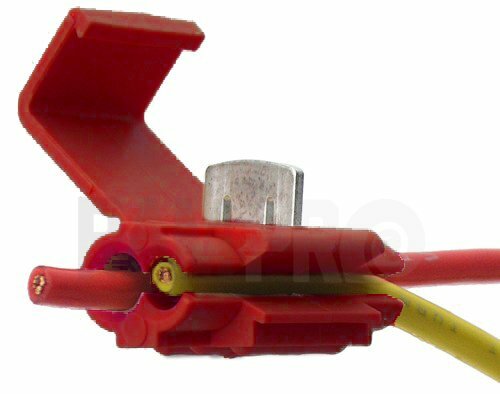 These wire splice connectors are simple to use and come with built-in stop for correct wire positioning to provide a reliable connection for each wire. Gauge is based on American Wire Gauge (AWG). HOW TO USE: Clamp the splice connector onto the existing wire (that you want to extend) in the hole that goes through and through. Then insert the additional wire into the blocked hole (only one side is open) make sure it is fully inserted. Using a plier Crimp down the metal blade into the plastic Housing. Close the lid securely and make sure to hear the safety click, and you're simply DONE. • A very quick and reliable way of connecting additional cables to existing wiring in, for example fitting car alarms, remote starter, keyless entry, OnStar, dash/rear view backup camera, radar detector, Wi-Fi, Bluetooth, entertainment system, stereo, horn, audio speakers, radio/cassette/cd/MP3/DVD player units, USB port, GPS navigation, fog lights, headlights, landscaping wiring, exterior/interior lights etc. The cables to be joined are placed inside the snap-lock connector, the cover is pushed home with a plier and locks shut complete the connection. 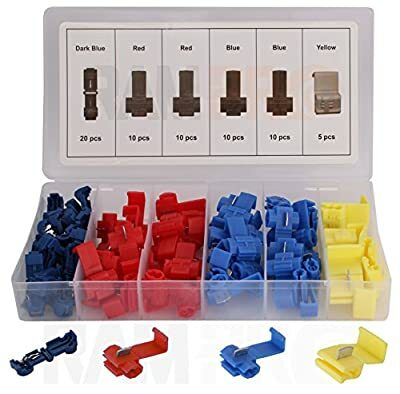 The Ram-Pro Tap Quick Splice Assortment Connector Set of 65 pieces includes 20 pieces of T-Tap Female 18-24 Gauge (Dark Blue), 20 pcs of 22-18 Gauge (Red), 20 pcs of 18-14 Gauge (Blue), 5 pcs of 12-10 Gauge (Yellow). Wire cross-section range: 0.75-2.5mm²/0.5-1.0mm²/0.75-2.5mm²/4-6mm². EASY TO USE: Connectors are Industry color coded with documentation for quick confident identification, and easy installation (Color codes are detailed in the Product Description). USES: For your Car, SUV, Truck, Home, Boat, Camper RV, ATV, UTV, Golf Car, and most electrical device connections like Alarms, Remote starter, Keyless entry, OnStar, Dash/Rear view Backup camera, Radar detector, Wi-Fi, Bluetooth, Entertainment system, Stereo, Horn, Audio speakers, Radio/cassette/Cd/MP3/DVD player units, USB port, GPS navigation, Fog lights, Headlights, And more. 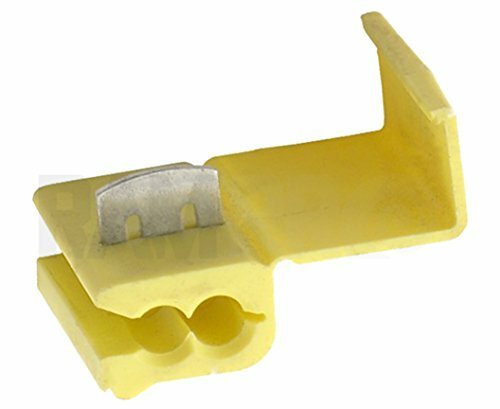 MATERIAL: Strong Polypropylene-plastic with Tin-Plated Brass terminal - A must have Item for your vehicles and electrical devices installations - Packed in a See-through molded organizer case to protect connectors, and for easy transport and storage.